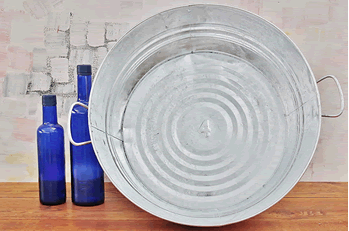 Old Galvanized Wash Pan is a great way to add a classic feel to your displaying options. The durable steel is hot dipped in a bath of molten zinc that helps prevent corrosion. The zinc-iron alloy layers bond to the steel then becoming apart of the steel not just the surface. 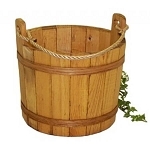 Buy yours today and create a beautiful rustic old fashioned display. 4.5" Harvest Pan available. Overall Dimensions: 6-1/8" H x 18" Top Dia. x 14" Bottom Dia.